Age related macular degeneration (AMD) is one of the most common causes of poor vision after 60. 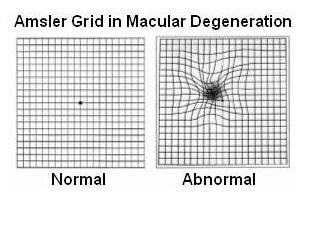 AMD is a deterioration or breakdown of the macula. The macula is a small area at the center of the retina in the back of the eye that allows us to see fine details clearly and perform activities such as reading and driving. The visual symptoms of AMD involve the loss of central vision. While peripheral vision is unaffected, one loses the sharp, vision straight ahead that is necessary for driving, reading, recognizing faces, and detail objects. Nine out of 10 people who have AMD have the dry form (called atrophic), which results thinning of the macula. Dry AMD takes many years to develop and currently there is no treatment for this form of AMD. One out of 10 people who have Wet AMD (called exudative) is less common, but is more serious. In the wet form of AMD, abnormal blood vessels may grow in a layer beneath the retina, leaking fluid and blood and creating distortion or a large blind spot in the center of your vision. If the blood vessels are not growing directly beneath the macula, laser surgery is the only proven effective treatment to date for wet AMD. The procedure usually does not improve vision but prevents further loss of vision. For those patients who have wet AMD the blood vessels are growing directly under the center of the macula, different medications (such as Avastin) may be used to treat some patients with fewer visual side effects than other treatments. Promising AMD research is being done on many fronts. In the meantime, high-intensity reading lamps, magnifiers, and other low vision aids help patients with AMD make the most of their remaining vision. Although the exact causes of AMD or not fully understood, a recent scientific study shows that antioxidant vitamins and zinc may reduce the impact of AMD in some people with the disease. Among people at high risk for late-stage macular degeneration (those with intermediate AMD in both eyes or advanced AMD in one eye), a dietary supplement of vitamins C, E and beta carotene, along with zinc, lowered the risk of the disease progressing to advanced by about 25 to 30 percent. However, the supplements did not appear to benefit people with minimal AMD or those who have no evidence of macular degeneration. ​It is important to remember that vitamin supplements are not a cure for AMD, nor will they restore vision you may have already lost from the disease. However, specific amounts of certain supplements do play a key role in helping the people at high risk for advanced AMD to maintain their vision. You should speak with your ophthalmologist to determine if you are at risk for developing advanced AMD, and to learn if supplements are recommended for you.